Hello everyone! Wow, it’s been a long time. Too long, I say! It’s been so long that I think it’s only fair to re-introduce myself and this site. So! My name is Dylan and this is Sega Does, the site that will one day have a review of every game ever featured on a Sega console. From the SG-1000 to the Dreamcast, not one game will be spared! I started Sega Does back in April of 2014 and worked regularly on the site until about June 2017. In that 3+ year span, I reviewed, in chronological order, all of the SG-1000 library, about half of the Master System library, and got knee deep in Genesis/Mega Drive and Game Gear games. In July 2017, I stopped. The official reason was I felt convicted about using ROMs. This was true, but also, I think I just needed a break. I tried starting up the site several times throughout 2017 and 2018, but none of these times felt right. I’d review a couple games, then stop again. In October 2018, I moved Sega Does to a different hosting platform. For some reason, this move has made all the difference. I find myself invigorated to play and review old Sega games again, like the old days. Admittedly, I have no idea what Sega Does 2.0 will look like beyond written reviews. Books? A podcast? Videos? Who can say. I’m a one-man operation at the moment, and while that might change in the future too, Sega Does isn’t the only project I have going. Whatever Sega Does ends up becoming, I hope you enjoy the new content. Now, onto the Year in Sega – 1991! 1990 was a transitional year for Sega. The Master System was kept on life support in the States and Europe. The Genesis entered its second year in Japan and its first year in the West. And the Game Gear made a cautious debut in Japan in the latter half of the year. A total of 27 games were released in 1990 for the Master System in the United States and Europe, and out of those 27, only a handful are worth playing. Master System originals like Alex Kidd in Shinobi World, Golfamania, and Aerial Assault injected the console with some much-needed vitality. Particularly as true stinkers like Fire & Forget II, Assault City, Indiana Jones and the Last Crusade, and so many more, did their best to usher the system into the grave. 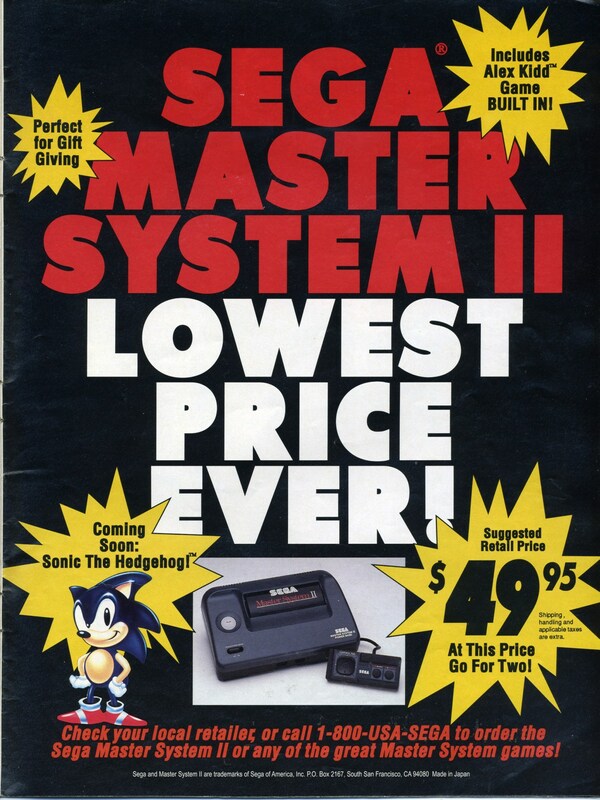 1991 should be a much better year for the Master System, perhaps the best since 1988. Giving the Game Gear the same internal components as the Master System made it easy for Sega and other developers to essentially create the same game for both systems. As such, the Master System 1991 release list balloons to 39 games, and many of those games are of significantly higher quality than the games released in 1989 and 1990. 1991 Master System Games I’m looking forward to: Gain Ground, Castle of Illusion, Golden Axe Warrior, Sonic the Hedgehog, Lucky Dime Caper. Ok, slight exaggeration there, but hot dang did Sega’s beloved 16-bit console ever get a ton of shoot-em-ups in 1990. I’m not going to link to these, but I will list them all for posterity, and so you can see what I had to put up with: Darwin 4081, Whip Rush, Thunder Force III, Phelios, XDR, Insector X, Hellfire, Burning Force, Arrow Flash, Fire Shark, Elemental Master, Dangerous Seed, Darius II, M.U.S.H.A., Gaiares, Heavy Unit: Mega Drive Special, and Battle Squadron. These are just the pure shoot-em-ups. Games with shoot-em-up elements include: Target Earth, Space Invaders ’91, Final Zone, Granada, Atomic Robo-Kid, and Wonder Boy III: Monster Lair. That’s 23 games in total. So nearly a third of all games released for the Genesis/Mega Drive in 1990 were shoot-em-ups or contained shoot-em-up elements. Unreal! Now, it should be said that I enjoy the shoot-em-up genre as a whole. I gave many of the aforementioned games high marks, after all. Still, by the time I reached Gaiares, I was ready for a break. Thank goodness for games like Strider, Psy-O-Blade, Castle of Illusion, and Star Cruiser to break up the genre monotony. Looking at the 1991 Games List, there are a lot of Japan-only Mega Drive titles in the first half of the year. Will they be good? Will I be able to understand them? Who can say. 1991 is also when the Genesis broke out in the States, thanks to the massive success of Sonic the Hedgehog. Not even the release of the SNES with Super Mario World could temper the growth of the Genesis in ’91 and, by January 1992, Sega had 65% of the 16-bit console market (of course the Genesis had a two year head start over the SNES, but a success story is a success story). All told, about 152 games were released for the Mega Drive/Genesis in Japan, the United States, and Europe. That’s over double the amount released in 1990. 1991 Genesis/Mega Drive games I’m looking forward to: Gain Ground, Shining in the Darkness, Zero Wing, Sonic the Hedgehog, Streets of Rage, Rent A Hero, Wonder Boy in Monster World, Toe Jam & Earl, Ys III, Rolling Thunder II, QuackShot. The Game Gear released on October 6th, 1990 in Japan, and as such, only saw 10 games between its official release date and the end of the year. I expected very little from these games, and because of this, I was pleasantly surprised. Revenge of Drancon (Wonder Boy), Dragon Crystal and Shanghai II were three top-notch titles. The rest were more in line with my limited expectations, although Zan Gear and Taisen Mahjong HaoPai seem decent if you have a firm grasp on Japanese. The Game Gear would see a wider release in the States, Europe and Brazil in the first half of 1991, and as such, its game list expands to 46 games. Some of these overlap with Master System titles releasing the same year, so expect multi-system reviews of games like Lucky Dime Caper. Others are Game Gear-exclusive, and in many cases, exclusive to Japan. 1991 Game Gear games I’m looking forward to: The GG Shinobi, Fantasy Zone Gear, Wagyan Land, Galaga ’91, Ax Battler – A Legend of Golden Axe, Ninja Gaiden, GG Aleste. And finally – as if Sega needed another system to support – the Sega Mega CD would be released on December 12th, 1991 in Japan. I’ll do a full-blown writeup of the console add-on when I get to December ’91, but needless to say, Sega really didn’t need to release this thing. Yes, it is a neat piece of early 90s hardware, and yes there are some great games for it, but its release marked the beginning of Sega taking advantage of its loyal fans. A Sega CD here, a 32X there (a CDX weeping softly in the corner), and before you know it, consumers rightly think Sega’s bilking them for all they’re worth. Of course, the story’s more complicated than that, but the fact remains: whatever consumer goodwill Sega had built up by 1992 was all but lost by 1995. We’ll get there. In the meantime, six games were released for the Mega CD in 1991, and frankly, none of them look that appealing. But if you were to ask me, which 1991 Mega CD games I’m looking forward to, I would say… all of them? Sort of? They all look so deliciously bad-good, and I’m absolutely ready to dive into the bizarre Sega CD library. Are there any 1991 Sega moments you’d like me to cover? Any favorite games you’re looking forward to? Let me know in the comments below! This website design is so infinitely and unbelievably superior to the old dark-grey-on-black… Thank you so much for changing it. Cool to see you so excited about the brand new Sega adventures! I’m personally curious about Blue Almanac – I hope you manage to get the official SFT release in English, since it’s vastly improved compared to the old translation (and it’s practically unavailable online). 1991 is probably the year with the largest number of Japanese exclusives for the MD, but you’re still thankfully far away from the Saturn/Dreamcast Japan-only madness. 😉 For MS, Danan, Golden Axe Warrior and Lucky Dime Caper are my favs from 1991, hands down. Also, like you mentioned – lots of multi-system reviews incoming! Good to hear from you cccmar! The name Blue Almanac rings a bell, but I don’t know much about it. I’ll keep an eye out! I actually started to do that back in 2009 when I first played Shining in the Darkness on Sonic’s Ultimate Genesis Collection for the PS3. I didn’t get very far with the graph paper, but the game itself was awesome. Even though I’ve played it so many times, seeing the name ‘Streets of Rage’ still makes me all tingly with excitement. There are a bunch of big hitters across all the platforms on the way! Well, except for the CD. Of course, I hope for some hilarious garbage as well! A great write-up of the gaming year to come. Looking forward to seeing the coverage! That’s the thing Nintendo will never admit about the Super NES launch in September 1991. They talk about Super Mario World and the rest, but they will never admit that their console was in second behind the Genesis, and would be for the first few years of the so-called ’16-bit wars’. For the first time Nintendo was losing a console war, and it wouldn’t be the last even after Sega squandered their advantage. Yeah, hubris definitely overtook Nintendo more than once in the 90s, and again after the Wii. Some great games coming up! On the Mega Drive/Genesis, I’m looking forward to Twin Cobra, Midnight Resistance, Shining in the Darkness, Langrisser, Sonic, Quackshot, Wonderboy in Monster World, and a whole lot more. On Master System, I’ve got a soft spot for Danan, Lucky Dime Caper and Rampart (try to get a second player for that), and I love the SMS versions of Sonic and Castle of Illusion.